Below are some additional Toyota related resources for your convenience. Feb. 27, 2007: Original announcement. Toyota states it will build the Highlander SUV in Blue Springs, Mississippi; outside Tupelo. July 10, 2008: Production adjustment. Toyota moves the Highlander SUV to its Indiana plant in Princeton. Toyota names TMMMS as new home of the Prius.Dec. 15, 2008: Plant construction put on hold indefinitely due to market conditions. June 17, 2010: TMMMS announces it will produce the Toyota Corolla in the Fall of 2011. TCI oversees all divisions of Toyota?s sales, marketing, parts, service, Lexus, and Industrial Equipment operations in Canada. TCI zone offices coordinate Toyota vehicle sales, parts and services for dealers in ten provinces and one territory. 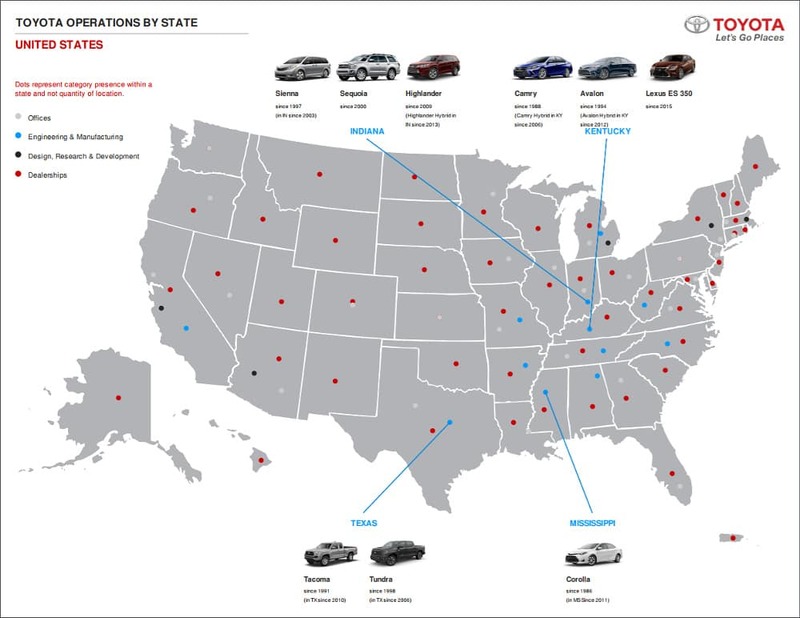 There are 239 Toyota dealerships across Canada, of which 226 are exclusively Toyota and 13 are Toyota/Lexus. 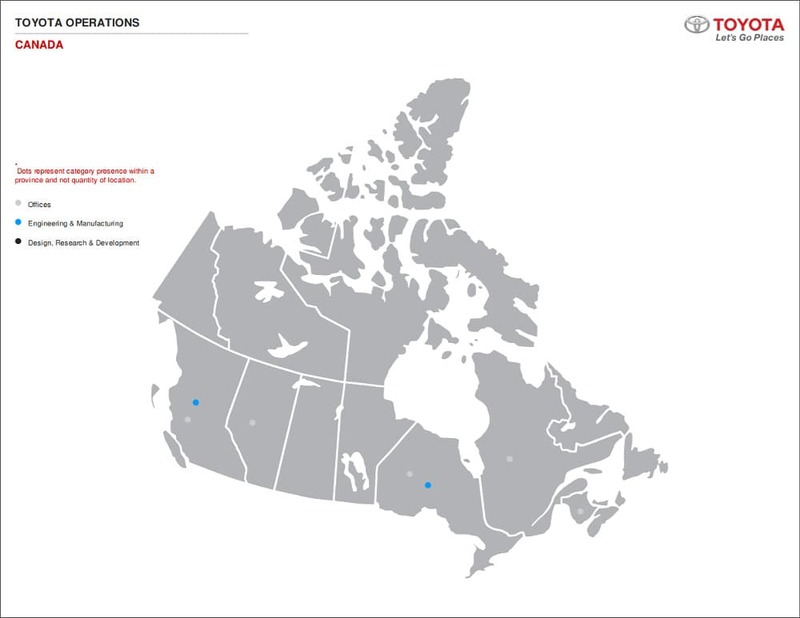 Established in 1964, TCI is headquartered in Toronto, Ontario with zone offices in Alberta, British Columbia, Nova Scotia, Ontario and Quebec. CAPTIN is responsible for the design, development and manufacturing of aluminum wheel products for Toyota. Established in 1983, CAPTIN has a manufacturing plant in Delta, British Columbia. Established in 1986, TMMC has manufacturing plants in Cambridge and Woodstock, Ontario. The Cambridge plant builds the Corolla, Matrix and Lexus RX 350 for North America. It is the first plant outside of Japan to produce Lexus vehicles. The Woodstock plant builds the RAV4. TCCI provides retail financial services to Toyota, Lexus, Hino and Subaru customers and wholesale financing to Toyota, Lexus and Hino dealers across Canada. Established in 1990, TCI is headquartered in Markham, Ontario with branch offices in British Columbia, Nova Scotia, Ontario and Quebec. Toyota’s first cold-weather facility outside of Japan is used primarily to test the operation of Toyota products in sub-zero conditions. Built by TCI in 1998, this facility is located in Timmins, Ontario. A consolidated subsidiary of Hino Motors in Japan, a subsidiary of Toyota. HMC assembles markets and sells Hino light and medium-duty trucks in Canada. A Toyota Group company since 2001, HMC is headquartered in Mississauga, Ontario, with regional sales offices in Alberta and Quebec, and an assembly plant in Woodstock, Ontario. Toyota Motor Sales de México is responsible for sales, marketing and service operations for Toyota vehicles in Mexico. 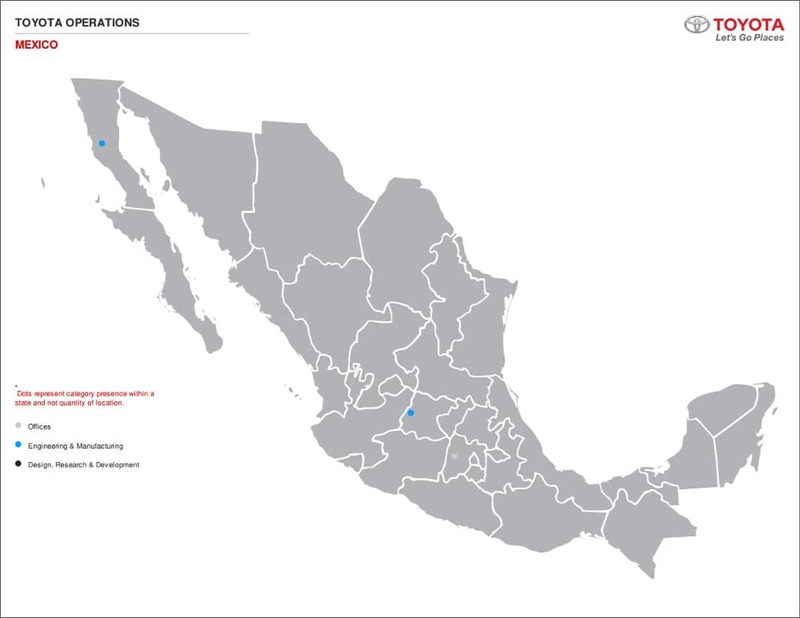 There are currently 54 dealerships in Mexico. Toyota Motor Sales de México is headquartered in Mexico City and was established in 2001. Toyota Financial Services México S.A. de C.V.
Toyota Financial Services México provides finance products to Toyota dealers and their customers. Toyota Financial Services México is headquartered in Mexico City, Mexico and began operation in 2002. TMMBC builds Tacoma pickup trucks and Tacoma truck beds. The truck beds are used in production both at TMMBC and NUMMI. TMMBC was established in 2002 and has a manufacturing plant in Baja California, Mexico.